It’s Picnic Time – Remember Food Safety! | Winners Drink Milk! It’s Picnic Time – Remember Food Safety! Nothing’s better in the summer than enjoying a picnic with family and friends. Picnic at the park, on the beach, or even in your own back yard but if picnic foods are not handled safely you are inviting foodborne illnesses to the occasion! Wash your hands well before handling food and always use clean containers, utensils and work surfaces. Dirty hands and equipment can lead to contaminating food with harmful viruses and bacteria. KEEP HOT FOODS HOT AND COLD FOODS COLD. Cold foods need to be stored at 40 degrees or below (use frozen gel pacs or lots of ice in a good cooler) and hot foods need to be maintained at 140 degrees or more (wrap food containers in towels and place in a Styrofoam cooler or heavy box). Unsafe food temps can lead to food poisoning which results in illnesses or even worse!! Don’t prepare foods more than one day in advance unless you plan to freeze them. Cooked foods invite bacteria to grow so prepare the food, spread it in shallow pans (no more than 2 inches deep) and refrigerate immediately. Cool completely and freeze if possible. Most foodborne illnesses result from improper cooling. Note that frozen foods should be thawed in the refrig—just give them enough time to do so before serving. Using mayo in your dishes? Mayonnaise-enhanced foods need to be kept COLD. Mayo by itself is not the culprit; it’s very acidic. But when you mix mayonnaise with other foods (especially proteins), bacteria loves to grow if the mixture becomes too warm. A suggestion: prepare recipes but leave the mayo out until just before serving. ALWAYS WASH THE RINDS OF MELONS BEFORE CUTTING INTO THEM!!!! Couldn’t believe it when I saw this safety tip a few years back! We don’t eat the rinds so why bother washing them? ENVISION THIS: consider how many places a melon has been and how many hands have handled it before you purchased it? As you cut into the unwashed melon, any bacteria on the rind will be taken into the eatable fleshy part. YUK!!!! Immerse that melon under the facet and scrub it well with a veggie brush before cutting into it. 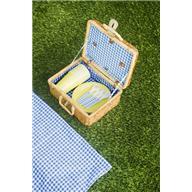 Picnics don’t lend themselves to washing facilities so make sure to bring loads of utensils and dishes to prevent cross-contamination (i.e.—don’t use the same spoon to spread barbegue sauce on chicken, wipe it off and then use it to mix/serve a salad). It’s handy to leave serving containers out when people are eating but that’s another easy invite for bacteria to grow. Invite guests to seconds but show them where to find them—in insulated containers. This keeps bugs away too!! 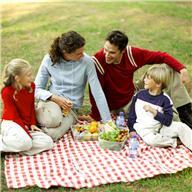 Plan that picnic with these safety tips in mind and you and yours will have a happy, healthy time!!! ENJOY.